Now I live in Scotland, it doesn't necessarily snow at Christmas, but it's certainly a Winter Wonderland. The festivities warm up as fast as the temperatures outside fall down towards (and below) freezing, and we get to sing our favourite seasonal songs. In coming weeks, I will muse on some of my favourite ways to sing Christmas. As with some of my favourite ways to enjoy Shakespeare, I quite like both traditional and reimagined ways of singing Christmas. Later in the season, I'll issue a warning to anyone who messes up my all time favourite carol. This week, however, reimagining Christmas carols receives more favourable reception. 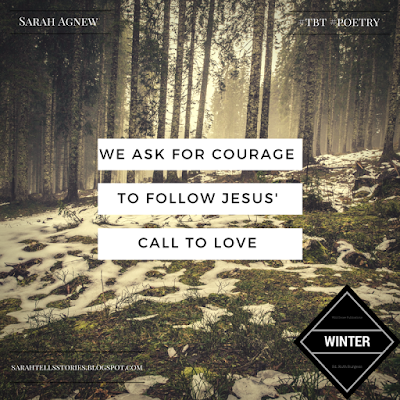 On the day when my copy of Winter arrived, these lines seem a fitting Throwback Thursday celebration, from my contribution to the book, 'We ask for courage', a prayer/poem for Christian Unity Sunday. As a child and as a teenager, I was thin, could eat what I wanted. Was it the depression, the not so good lifestyle choices because of the depression, the medication to help live with depression? Was it the hormone imbalance (PCOS - read about it, it's loads of fun), which who knows how that came about, inevitability, depression, medication, lifestyle choices ... ? I was not thin any more. I did not recognise the person in the mirror anymore. It took me most of my twenties to learn to like my body again, as it is. And I mean like it, love it: not settle, or come to terms with, or accept. I asked Facebook friends. I received helpful responses from their experience. I also received further information which, in the voice in my head, sounded condescending and conveying a subtext of you're a child who knows nothing. But I asked, so getting annoyed is more my own sensitivity to being thought of as stupid than anything else. But when I tell Facebook friends what I am feeling – sad, ill, in pain, homesick – and then get advice about how to fix it, my getting annoyed might be more excusable. For that advice is unsolicited. Years ago I completed the Myers-Briggs personality scale. Some people find that scale and/ or all personality scales pointless, inaccurate, inadequate. I have found it helpful as a point of reference for understanding how I engage with the world. I have been pondering again the notion of the tent-maker, inspired by the apostle Paul who mentions his work crafting tents as a way of earning his living while on his itinerant mission to the Gentiles. This image is often invoked as a solution to the challenge of diminishing resources in a church that still needs leaders, still ordains ministers. It is particularly encouraged in pioneer leaders, a designation sometimes applied to me. As I pondered this approach to ministry, a random thought that occurred to me out of the blue one morning recently, I remembered how I felt any time someone suggested that I might like to consider 'tent-making', or bi-vocational, ministry. Angry. Dismissed. Unseen and misunderstood. 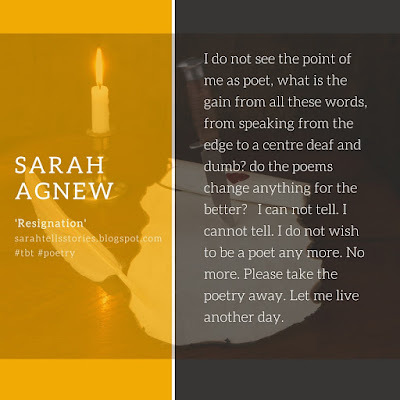 Help keep the poems coming : become a patron today! for the returning of the sun?